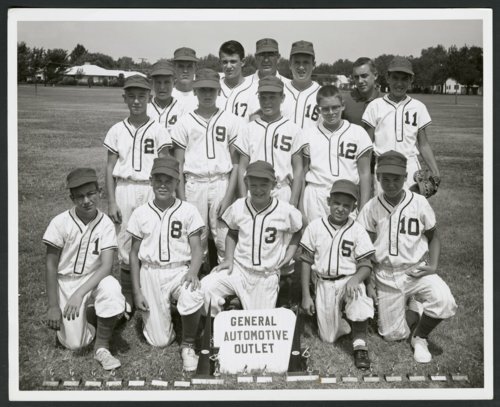 This photo from the early 1960s is of the General Automotive Outlet youth baseball team in Wichita, Kansas. Kneeling in the front row are (l to r): Mark Berndsen - 1; Greg Linnebur - 8; David Welch - 3; Phil Philwalkup - 5; and Bernie Linnebur - 10. Standing in the second row are (l to r): Sheamus Litchlighter - 2; unidentified - 9 and 15; and Mike Hensley - 12. In the third row are (l to r): Larry McDowell - 4; Bill Caperton - 17; David Knox - 16; and Ken Nelson - 11. In the back row are (l to r): Larry Schaar; Martin Berndsen (coach); and Steve Berndsen (coach).